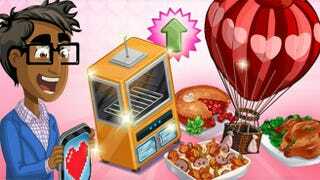 We've reached the halfway point in Colby's Convection Oven event in ChefVille, and it's time to unlock more Valentine's Day dishes before it's too late. Colby has brought three new quests to the game in a "Last Ditch Convection" series, and we're here with a guide to helping you finish them off (thanks to Zynga) before Madeline can make her choice between Colby and Rock. The Intermediate upgrade to the Convection Oven requires six Heart-Shaped Cookie Cutters and six Heart-Shaped Trivets to unlock. The Cookie Cutters are earned by posting a general news post on your wall, while the other items are earned by sending out individual requests to your neighbors. When you collect all 12 of these items, you'll unlock three more dishes, including the Video Game Hen. This dish is cooked using two Chicken and two Garlic over a period of two minutes. The first Cyber Love Connection "Ribbon" is earned after cooking the dish three times. When you complete this first quest, you'll receive a Beet, one Sugar, and 10 XP. The Beet Pi is prepared using four Beets, two Flour, and one Milk. It takes five minutes to prepare. As for the Onion Gravy, it's made inside the Onion Gravy Station with two Onions and one Salt. It takes just two minutes to create. Finally, the Greek Alphabet Soup is one of the "Basic" dishes in the Convection Oven, and it requires four Tomatoes and two Flour to prepare. When you've finished this second quest, you'll receive three more Onion Gravy, 10 XP, and 15 coins. The Casserole's Theorem is the final dish in the Convection Oven's Intermediate level, and it takes 10 minutes to prepare using three Flour, two Onion Gravy, and two Mushrooms. Completing this final quest gives you three Rice, one Pepper, and 15 coins. By this point, we'll hopefully find out whether Madeline has chosen Rock or Colby as her Valentine, but either way, we wish you the best of luck in completing these quests before they expire in three days. What do you think of these final three dishes and quests in ChefVille's massive Valentine's Day event? Sound off in the Games.com comments!